Things are deteriorating rapidly — or rather Nicholas Maduro's prospects of remaining in power are — in Venezuela following Monday's mutiny of military officers in an anti-Maduro neighborhood of Caracas leading to nation-wide opposition sponsored anti-regime protests Wednesday, and following President Trump's shock declaration bestowing sole legitimacy on "the President of the Venezuelan National Assembly, Juan Guaido, as the Interim President of Venezuela." A senior Trump administration official followed by saying “all options are on the table”. The sheer speed of events internationally, and the building momentum of opposition resistance on the ground, appears to be bringing the full weight of "counterrevolutionary" forces down upon the opposition: about a dozen countries now refuse to recognize Maduro's second term, internet and social media sites have been blocked through much of the country, Maduro has broken diplomatic relations with the US and given American diplomats 72 hours to leave, and the embattled president has called on all Venezuelans to defend the government against a coup. To top it all off, it appears American social media companies are ready to work the US government, given that Facebook and Instagram have removed Venezuelan Dictator Nicolás Maduro’s verification sign — this after opposition leader Juan Guaido swore himself in as "interim president". 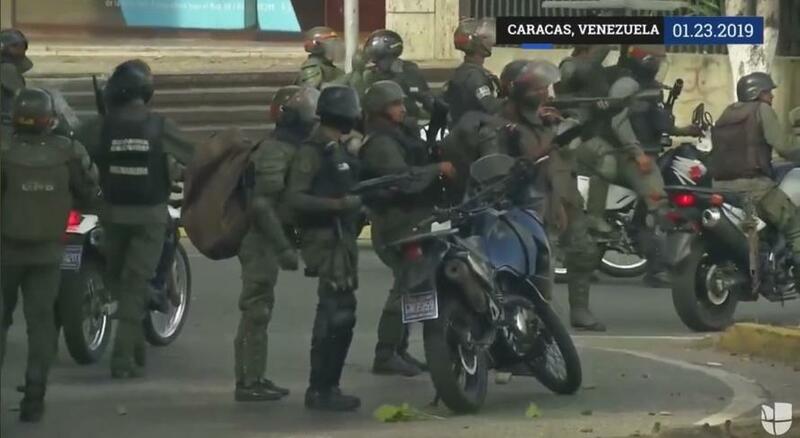 However, elsewhere protests have grown bloody, as further unconfirmed video appears to show pro-Maduro forces firing live rounds against protesters. Mass anti-government protests which drew a reported hundreds of thousands in places like the capital have given way to clashes with police, likely to continue throughout the night. National Assembly leader Juan Guaido personally called for anti-Maduro protests to be held nationwide on Wednesday — itself a historic date commemorating the end of Venezuela's military dictatorship in 1958. Protests throughout the day appeared increasingly confrontational with police, who responded with tear gas and riot control measures. There are also reports of major internet and social media blockages throughout the country. Reuters reported previously that "Venezuelan security forces fired tear gas at opposition demonstrators blocking a highway in capital Caracas on Wednesday, amid growing pressure on socialist President Nicolas Maduro, Reuters images showed." Local news channels showed police attempting to clear the highway by firing what were described as "warning shots". Opposition sources in other parts of the country are claiming, however, that police are increasingly resorting to "live fire". Meanwhile it appears in some places anti-Maduro demonstrators have attacked United Socialist Party of Venezuela offices. 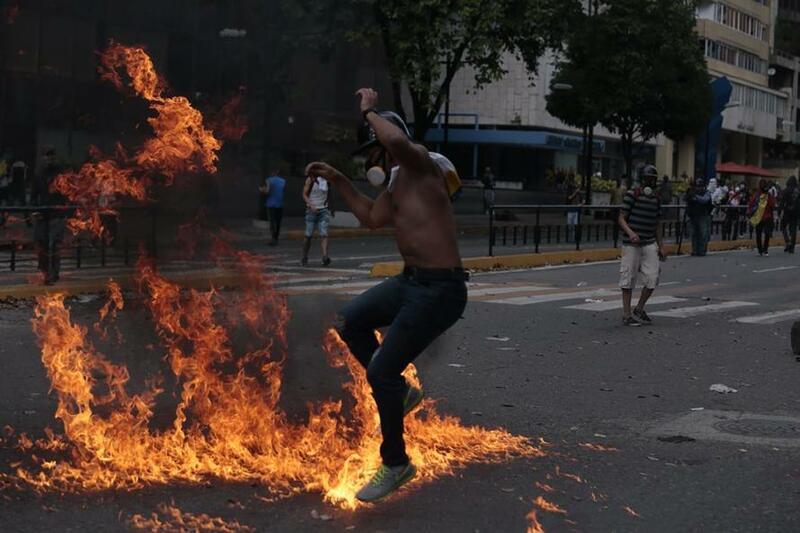 Clashes are now rapidly escalating into violence as uncertainty grows. Much will be determined in the following days and will depend on the loyalty of the armed forces.